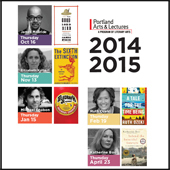 Since 1984, Portland Arts & Lectures has brought the world’s most celebrated writers, artists, and thinkers to Oregon. In addition to live events that are broadcast statewide on OPB radio, the program connects readers and writers of all ages with classroom visits and workshops. Click here for more information. Full subscriptions to the series start at $75 and are available online or by calling our box office at 503-227-2583. All events occur at the Arlene Schnitzer Concert Hall in downtown Portland, Oregon.